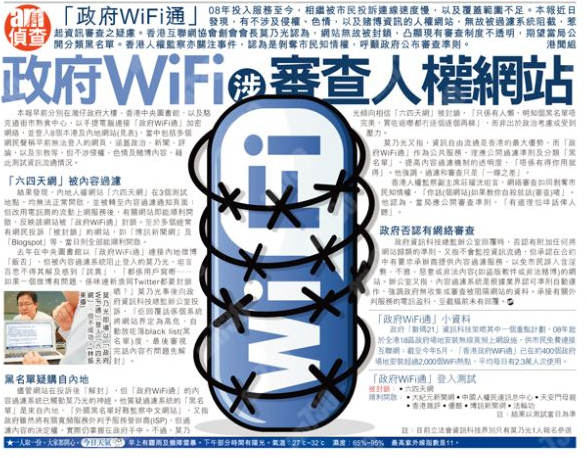 A local newspaper, AM730 [zh] found out that the Hong Kong government free wifi service is filtering away a number of politically sensitive websites. 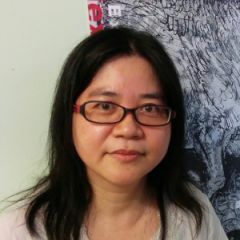 Even though most of the websites have been re-opened upon receiving netizens’ complaint, netizens and human right groups are concerned about the lack of monitor over the filter list. Report from AM730 on Hong Kong government's free wifi filter. Charles Mok, a famous blogger and internet expert, is among the first to pay attention on the filter problem. According to the report, last year, when he tried to access a mainland Chinese social media platform, “FanFou” from the government free wifi service in the central library, he could not access the site. He filed a complaint and the reply was that the filter system had automatically identified the websites as dangerous and placed it under the black list. After they received the complaint, they reviewed the content and lifted the ban. The most recent test is done by journalists from AM730, who tried to access 8 websites from 3 different wifi spots. A human right website “64tianwang [zh]” is inaccessible in all three wifi spots. While the other 7 websites, which had been found inaccessible by some netizens, have been restored upon netizens’ complaint. The seven websites are: Epoch times [zh] (dissent news website), Information Center for Human Rights & Democracy [zh], Tiananmen Mother [zh], Hong Kong Commentary [zh], Youku [zh] (a mainland Chinese video platform), Boxun news [zh] (dissent news website) and FalunDafa [zh] (Falungong's official website). The government IT office explained that the wifi service contract does demand the contractor to provide a filter that blocks indecent, obscene and illegal content (such as illegal gambling websites), yet the government has not given any specific instruction on the filtering of content. Charles Mok believes that the contractor's filter “blacklist” is bought from mainland China and the contractor has failed to review the list. He points out that the government should publicize the “black list” and keep the filter system transparent to the public and to prevent the unnecessary censorship. In the recent consultation on the amendment of the Control of Obscene and Indecent Article, the Hong Kong government has proposed to sponsor local elementary schools to install filter for their school network. In reaction to the suggestion, local free speech and human right organizations demand the government to facilitate an open platform for the public to monitor private companies’ filter lists so as to prevent excessive censorship through the transplantation of mainland Chinese filter list to Hong Kong.